Less Expensive Than a Separate Hatch and Railing. CERTIFICATIONS: Rail meets OSHA required compliance for sage egress and ingress through rooftop hatch openings while hatch is in use. System comlies with OSHA CFR 29-1910.232 and CFR 29-1910.27. Construction meets ASTM certified under Specifications A792/A792M-06a; A653/A653M-06a; C726-05 and A36/A36M-05. Integral Roof Access Hatch and 1-5/8" OD A53 Grade-B Steel Safety Railing System, Yellow Powder Coated. Chain is Zinc Plated 3/16" ASTSM grade with quick links. Post Caps are Zinc Plated. Construction: 14 gauge galvanized steel with 12" high curb and 3-5/8" wide flange for securing to roof deck. All corners are fully welded and mitered. Hinge is a heavy duty box-type. 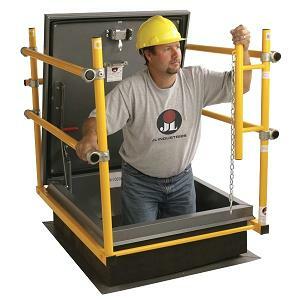 Cover: 14 gauge galvanized steel exterior and 22 gauge liner with with a TPE draft-seal gasket door seal. One inch thick insulation liner is built into cover. Load/Deflection: Steel roof hatch covers have been tested and approved to support a minimum live load of 40 lbs./sqft with a maximum deflection of 1/190th of the span, maximum negative load of 50 lbs./sqft wind uplift, and 110 mph wind load when cover is in an open position. Hardware: Hardware includes corrosion resistant heavy-duty hinge, heavy gauge automatic hold open arm with red grip, 2 compression-operated shock-absorbing gas cylinders for easy opening, exterior handle with integral padlock hasp and an interior locking handle with interior padlock hasp. Finish: Bonderite® Gray Hammertone Powder coat. Sizes: 30x36", 54 x30", 96x30", 36x36", 48x48"
Colors: Red, Yellow or other can be ordered with special order. $40 additional and 7-10-day leadtime.